Need information? Check out the Tourist Office. 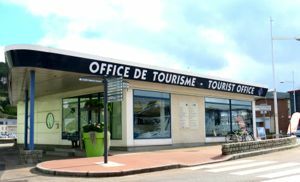 The Tourist Information Office in Fécamp is conveniently located on the Quai Sadi Carnot, right in the middle of the port area (map). You can pick up maps and other information about Fécamp and its main sites, including the Palais Bénédictine. The town has developed a series of walking tours focused on some of the different areas of interest in Fécamp, such as the Villa Ducale/Ville Abbatiale and the Côte de la Vierge, on Cap Fagnet, with its Chapelle Notre-Dame de Salut.